The collateral consequences of a marijuana arrest extend beyond the individual facing the arrest. When an individual also happens to be a parent, their children are also directly impacted. 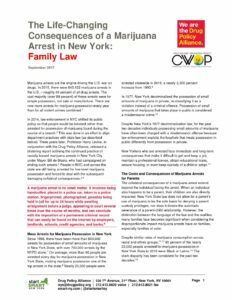 The consequences associated with a marijuana conviction frequently undermine the ability of thousands of parents across the state to provide stable environments in which their children have access to everything they need to develop properly and discover the unique contributions they each can make to society.